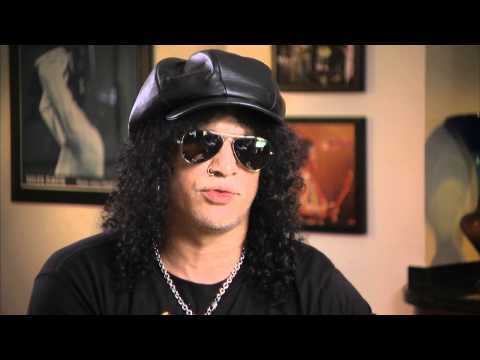 All versions of AmpliTube Slash feature models of the gear used by Slash in the studio and for his live performances. Additionally AmpliTube Slash provides a fully integrated multi-track recording studio for capturing ideas quickly and easily or producing entire songs and compositions (via in-app purchase on iOS versions). A robust song player section gives users the ability to play along with songs or backing tracks by importing them directly from their device library or computer. Here’s a sneak preview of Yonac Software‘s just announced Shredder for iPhone. Shredder is an app that lets you use your iPhone (or iPad) as a guitar synthesizer. Raspy synth swells? Gotcha covered. Bass-doubled riffs? Yup. Strings ‘n Things for beefing up the mix? Ditto. No special synth pickup needed. SHREDDER is a synthesizer controlled by your guitar. Pop it on, plug in your guitar, hit the “Guitar Synth” button and start jamming. SHREDDER comes with a true analog synth engine including dual oscillators, 3 types of filter, a dedicated FM envelope as well as other goodies like dual LFOs, a virtual pedalboard and more. Chose among 100+ built-in presets, or create and save endless ones of your own. SHREDDER comes with a dedicated guitar mix fader to mix in your guitar, and has attack and decay sensitivity faders to allow you to customize guitar tracking to your playing and input interface, whether its a USB in, a guitar adapter or the plain built-in mic. Headphones are required with use of the built in-mic. We’ll keep an eye out for this. It’s officially ‘coming soon’. 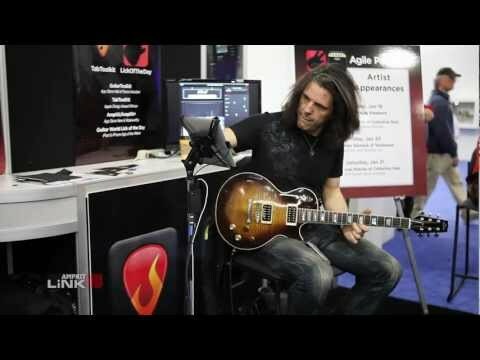 Alex Skolnick tries out the Peavey AmpKit Link HD guitar interface at the 2012 NAMM Show. He plugged a looper between his guitar and AmpKit, and went to work instantly. He starts with a clean jazz sound – but wait a minute and he gets the epic shred on. The only charging guitar interface: optional AC adapter charges your iPad, iPhone or iPod touch while you play. Stays connected: uses cable with dual locking connectors, rather than relying on friction fit – it just can’t fall out. Input and Output: LiNK HD is not only guitar in, but also headphone and line out. Control at your fingertips: control knobs for guitar input level and headphone output level. No need to launch an app. Mac and PC: LiNK HD works as a guitar interface for your Mac and PC, too. USB cable included. Built solid: sturdy jacks and cable connectors. Rubberized, non-slip coating feels great and reduces sliding. AmpKit LiNK HD is expected to be available in the second quarter of 2012. This is a preview of Frontier Design Group’s iShred Live, which features a new low pass filter with variable cutoff and resonant frequency control. The real fun comes in for those of you running iOS 5 on a camera equipped device. Face control! That’s right, you can control this effect with your face! It uses the new built-in iOS 5 face tracking to watch where your face is and track the cutoff and resonant frequencies when you move it. Maybe not the most practical way to control it – but at least they’re trying something new! 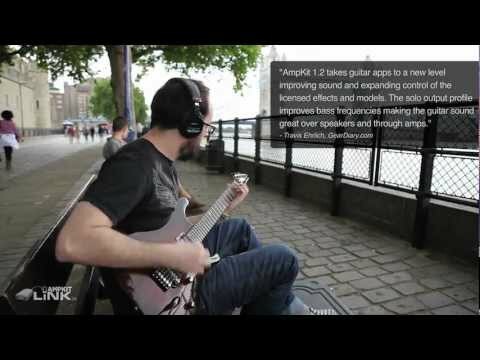 Here’s a quick demo of AmpKit 1.2 for iPad. All the audio you hear was produced by AmpKit 1.2 and AmpKit LiNK. Budda Superdrive 30 Series II. Fargen Olde 800, Super Collider and Hot Mod Baby Blues amps. Rocktron Zombie Rectified Distortion and Cottonmouth Fuzz effects. Sonic Edge J&J Overdrive and Tumbleweed Clean Boost & Compression effects. Two great new models of classic high-gain amps, the Sultan Rack 88 and the Uber Xtreme 101. 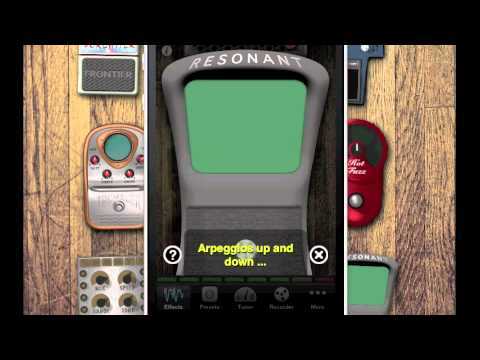 Here’s a quick demo of the Peavey AmpKit Link for iPhone, iPad and iPod touch.